Welcome to CSI - Computer Source Technology. This is your home for technology solutions, systems and service. Our products and services are focused for the needs of corporate, government and educational organizations. But, no job is too small or too large. Our Service Center specializes in networking service, LANs, WANs, programming, Internet ISP's, Internet Proxy Servers, hardware, custom servers, custom computer configurations, normal computer systems and components, memory, motherboards, multimedia, software, upgrades, repair, internet & web pages for your business and for your productivity. 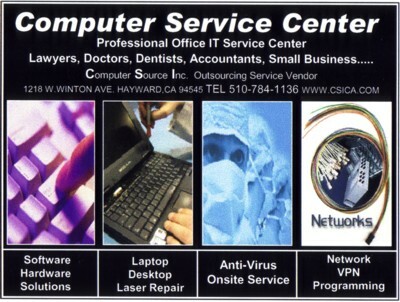 Please stop by our Service Center and get a free quote on any of your computer or network needs. If you are out of the area, or an international customer you can check our online store for fast delivery, reliable products and services. We look forward to serve you and the needs of your company or institution.